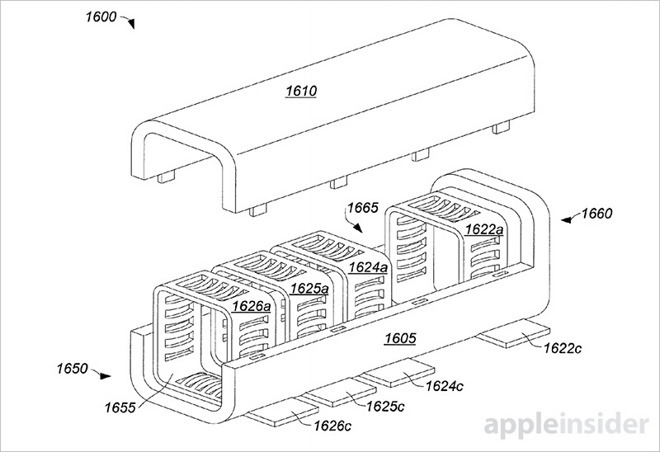 Published by the U.S. Patent and Trademark Office, Apple's application for an "Electronic device with hidden connector" details a method of protecting electrical device connections commonly exposed to the elements with specialized self-healing elastomeric material. Probes attached to power, data or audio feeds are able to puncture the elastomer, which re-seals itself upon their extraction. Specified as a silicone material, or polymerized siloxane, in Apple's invention, such substrates have the ability to "heal" themselves after penetration or other structural damage by reforming chemical bonds to regain mechanical properties. According to the document, an ideal elastomer would be able to regain at least 90 percent of its original tensile strength in the penetration region. Ideal elastomers would be mixed with other materials to achieve a color matching that of the portable device to which it will be applied, for example black or white for iPhone. Some manufacturing techniques call for the material to be applied over sensitive contacts in liquid form, while others allow for installation of pre-molded attachments. In other embodiments, regions of the elastomer in contact with exposed traces are doped with conductive particulates into which the connector probe is inserted. This method provides improved electrical contact and enhanced reliability. 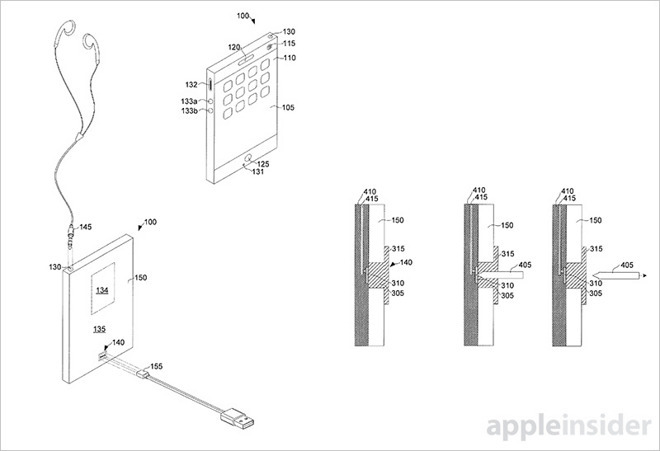 On the connector side, sharp probes designed to pierce the self-healing elastomer might be integrated into a connector body or plug, such as Apple's Lightning protocol. Alternatively, a separate device might be used to the same effect. Of particular interest is a well detailed example involving common 3.5mm audio plugs. According to Apple's document, self-healing elastomers can be applied to the opening of a headphone jack, as well as inside the cylindrical housing, to protect the exposed contacts from liquid, dust and other contaminants. The layer or layers of elastomer can be penetrated by a headphone plug, then reseal when the connector is removed. In another example the entire audio jack is completely filled with elastomer, with conductively doped bands of material interspersed over audio jack contacts to better interface with tip-ring-ring-sleeve (TRRS) conductors on a 3.5mm audio plug. Ports are disposed within the audio jack housing to accept elastomer displaced when the plug is inserted. Once the plug is removed, the self-healing material regains its initial mechanical properties, protecting the contacts therein from contaminants. It remains unclear if Apple intends to implement self-healing elastomers in its product lineup, but the company has been rumored to be working on a weatherproof iPhone. Other smartphone manufacturers have experimented with self-healing materials, the most notable being LG's Flex, but the requisite characteristics Apple describes are far beyond any contemporary commercial application. Apple's self-healing elastomer patent application was fist filed for in June 2014 and credits David I. Nazzaro, Tyler S. Bushnell and Ibuki Kamei as its inventors.